Fantastical combination of flavors that coat and steam-cook the salmon in the foil pack. This rich and delicious salmon will rock your next dinner! 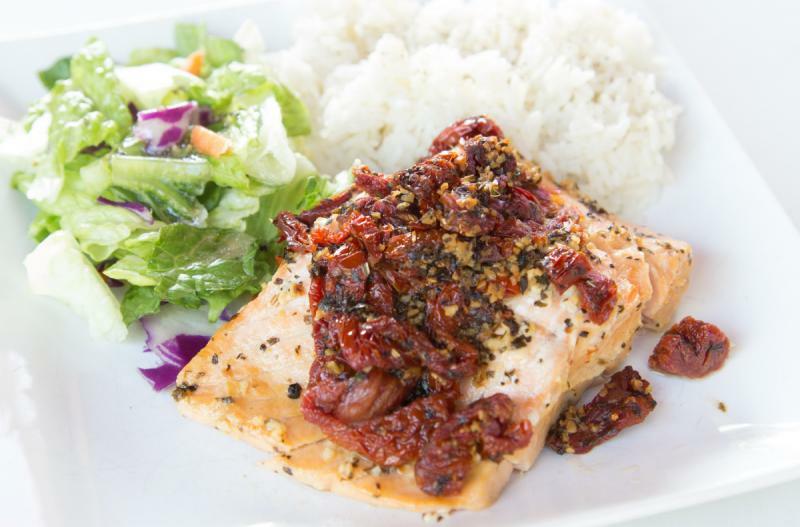 Serve Grilled Sun-Dried Tomato Salmon with rice and veggies. Slice the salmon fillets into 8 pieces. In a small mixing bowl, whisk together 8 Tbsp olive oil, 8 Tbsp lemon juice, 4 tsp minced garlic, 4 tsp dried basil and 6 oz sun-dried tomatoes. Wrap foil tightly around the salmon. Place all packs into a gallon-size plastic freezer baggies. Add label to baggie and freeze. Recipe is gluten-free when served with gluten-sides. Thaw salmon completely before adding foil packs to the grill and grilling for 20 minutes, or until salmon is cooked through.